The Halo Feed System Control is the solution to your feed delivery control needs. 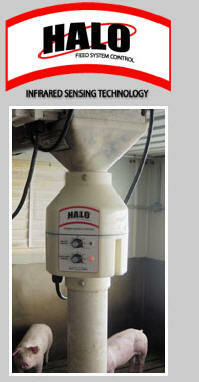 Halo uses an infrared sensor and fully featured electronics to manage your livestock feed system. High power infrared sensing technology eliminates problems caused by changes in moisture, temperature, humidity, and feed density. Halo electronics contain a delay start timer, maximum run timer, cumulative times, and alarm contacts. Halo electronics are enclosed in a Nema 4x watertight and corrosion proof enclosure for protection and can be mounted in an office, hallway, or right next to the feed motor. Halo comes fully prewired right out of the box for easy installation into any new or existing feeding system. Using a box for easy installation into any new or existing feeding system. Using a Halo Feed System Control in conjunction with the included alarm outputs will put your mind at ease when feeding your livestock. The system will automatically signal your alarm dialer to notify you when livestock is out of feed. Try a Halo Feed System Control today and you will never use a proximity switch or hopper level switch again.